if i come over to your house, and you pour me a glass of wine, stick some cheese in front of me or some crackers, i will sit on your couch happily until you hint that it’s time for me to get the hell out. but if you make your signature snack, that homemade hummus, hand-smashed guacamole or salsa from scratch, i will ignore your hints and yawns until the food is gone. i love those go-to recipes that people master in their kitchens and get “mmm’s” and other praises over constantly. that’s the tastiest stuff on the table and i hover around it the most. i think this fried okra might become my signature snack that i serve with a drink when special people come over. i don’t really make the effort to fry things that often, but guests present the perfect excuse. and frying is the only effort involved here. the okra picks up some mild favour from the turmeric and vinegar, and the only other ingredient is salt. the reason i don’t fry that often is that i have a slightly greater-than-healthy fear of it. hot oil needs to be taken seriously. indulge me this one-minute lecture: you have to fry in a pan deep enough so that the oil only comes half way up the side, because it’s going to bubble up a lot when the okra hits it. you need to lower anything you’re frying into oil very gently, and slide it in away from you. be ready with a splatter guard to cover the pan immediately once the okra is lowered in, for safety and to minimize the mess, because the splatters will be large. and you need to pay full attention–no phone, no kids or pets running around, no multi-tasking. but! don’t let me turn you off from this, because if you do these things, frying is easy and quick. and the only trick to accomplishing an even, crispy, non-greasy result is to fry in smaller batches at the right (hot enough) temperature. a fry thermometer works great for me. my mom has a sixth sense that comes with cooking all your life that allows her to basically gauge the readiness just by looking at the oil. this is the perfect thing to pass around with cocktails. 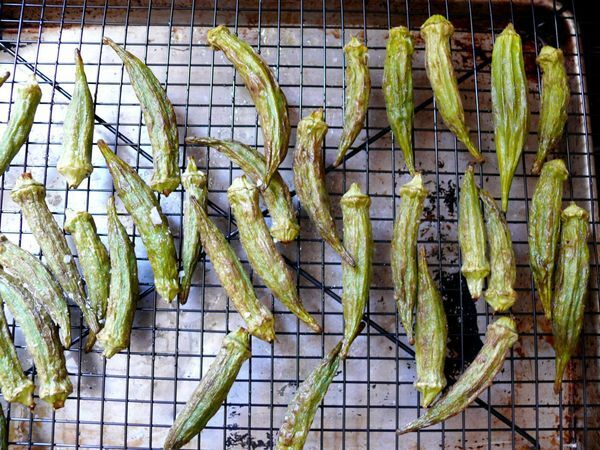 and even though, as with most fried food, they can’t be made ahead (the okra will get soggy if it sits around for more than half an hour), you can wash and dry the okra ahead of time. the rest of the process will only take 20 minutes start to finish. last tip–you know you can save that oil for frying your next batch right? skim off any burnt bits and put the cooled oil into a jar for the next one or two times that you’re frying this or anything that a little turmeric colouring couldn’t hurt. special tools: a fine mesh splatter guard. plus an oil or candy thermometer if you have one. mix the vinegar, turmeric and 1/4 tsp of salt in a large bowl. add the okra to the bowl and toss well to coat in the marinade and allow it to sit for five minutes. meanwhile, fill a deep skillet with about a half inch of oil. the oil should not come more than half way up the side of the pan. heat the oil over medium high heat to 350 degrees. carefully lower a batch of the okra into the oil, sliding it in away from you, and cover the with the splatter guard to minimize spalshes. do not overcrowd the skillet. 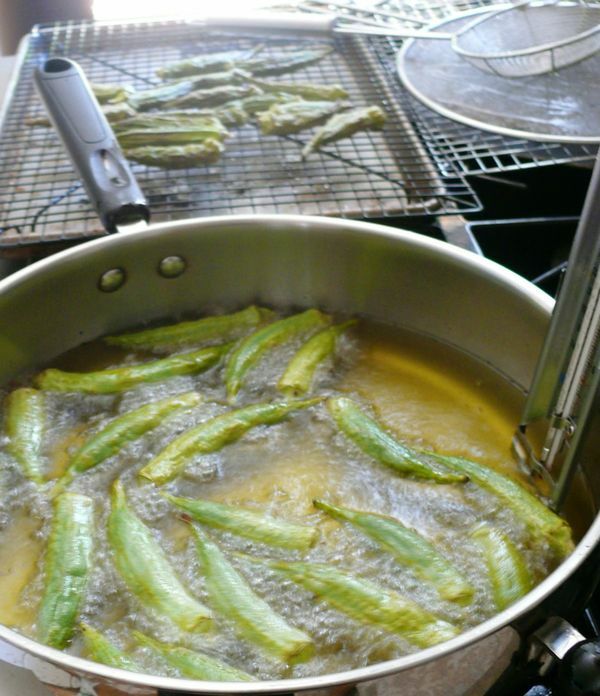 after the oil settles down a little, remove the splatter guard and fry for about five minutes, turning the okra, until they are lightly browned on all sides. 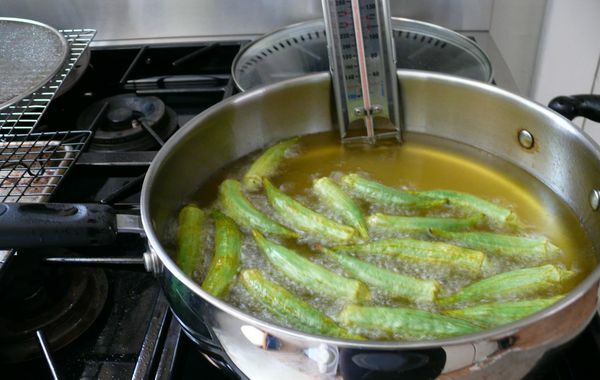 remove okra from the oil with a slotted spoon and allow to cool on a drying rack or on a paper towel-lined plate. sprinkle generously with maldon salt. repeat with the next batches. serve as soon as the okra are cool enough to handle. these will get soggy within a half hour of being cooked so they need to be eaten fairly quickly–but trust me, that’s going to happen anyway. serves 4-6 as a snack or appetizer. Oh wow!!! I can’t wait to try these. hi jen! glad you found this already! 🙂 and i hope you like it… let me know if you try it. i can’t decide whether to take you up on that if you’re ever in toronto, rachel, or whether to turn it down flat since there’s no way i wouldn’t make YOU cook for ME. 🙂 looking forward to your post on frying too. I love fried okra! Have you tried to batter them? i havent tried that. im sure that would be good but i suspect youd have the same eat them right away or theyll get soggy issue. except thats not really an issue!